A solar panel works by converting sunlight “photon energy” into direct current “DC” electricity. Solar panels are most commonly mounted to your roof in a northern direction to take in the most sunlight. 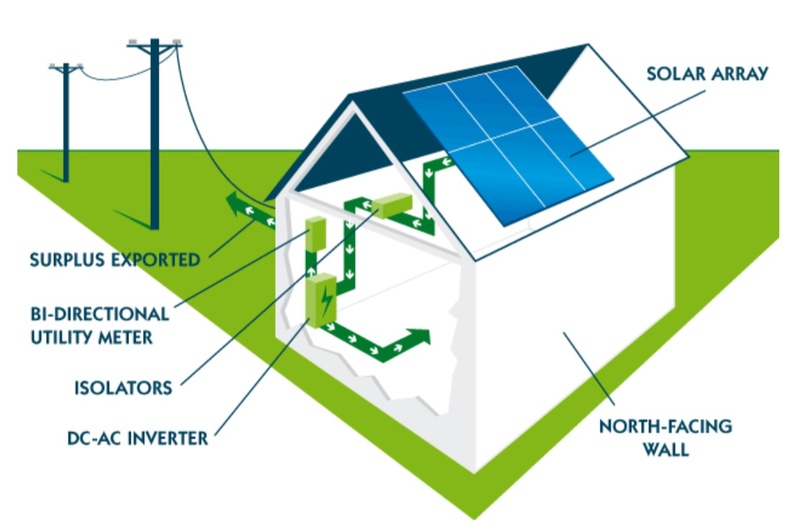 These panels are connected to an Inverter which is normally mounted to an external wall on your house. This Inverter converts DC current from the panels to usable AC current providing your whole house with free energy from the sun. Solar panels will still produce energy in overcast conditions and you can draw extra power from the grid if needed. If there is more power being generated from your solar panels than what you're using then this excess power will be measured, fed into the grid, and rebated back to you in the form of credit against your electricity account. Reduce or wipe out electricity bills. Cost of going solar is cheaper now than ever before. Ability to have backup power when grid outage.